I had been wanting to try the Benefit Box o’ Powders for ages, so when Benefit released this limited-edition palette with five full size powders I knew I had to go for it! The Benefit Cheekathon blush palette includes four full-sized blushes and one bronzer. 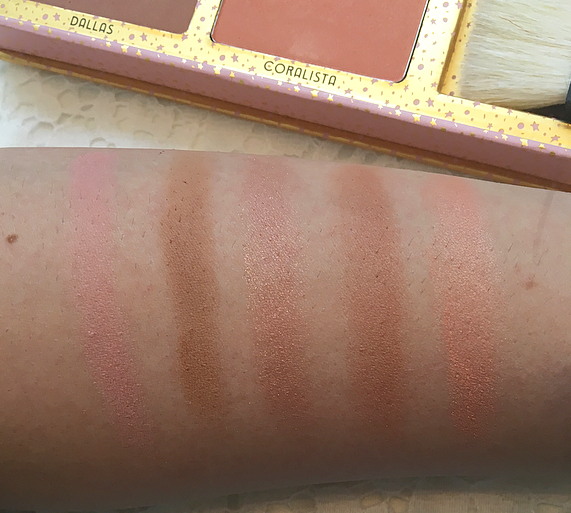 Dandelion, Rockateur, Dallas, and Coralista are the blushes and the beloved Hoola is the bronzer. The packaging of this palette is amazing. The cardboard container is colorful, sturdy, and just as large as it needs to be. It looks really nice on my vanity and I think it would be safe in travel. A big mirror is also included in the palette and so is a flat brush. I haven’t used it, but it feels soft. I swear, since this arrived these are the only blushes I’ve used. I love the pigmentation, the variety of shades, the packaging, and the staying power. Let’s break down the shades! Dandelion (Top left): Dandelion is a muted bubble-gum pink color with very subtle shimmer. I think it would be flattering on fair to medium skin tones and it’s one that I use a lot. Hoola (Top middle): the ever-so-popular matte brown bronzer, Hoola is great for contouring and getting a natural-looking tan! It is a warmer bronzer than the contour powder I was using before, so I feel that it is more flattering on my warm skin tone. However, it is still quite neutral and will work for a variety of skin tones. Rockateur (Top right): This blush is one of the main reasons I ordered this palette! It’s a mauve, rose gold blush that I honestly think would look nice on every skin tone. The “Rock” emblem is super cute and I hope it doesn’t fade away too quickly! I don’t use this one as often as I thought because it’s really glittery, but it’s nice for a night out or blended into the cheeks. Dallas (Bottom left): This is probably my least-favorite blush. It’s a dark brown-toned mauve with a hint of shimmer. I use it as a bronzer rather than a blush, but deeper skin tones might really love it. Coralista (Bottom middle): A bright, peachy, shimmery coral. At the moment I use very small amounts of this but in the summer when I tan I think this will be such a flattering color. All of the powders are really smooth and blendable. A little goes a long way! At 58$, this palette is a great value for money considering I use all the shades. Five full-size powders would be worth 145$ individually! If you’re looking to increase your blush collection or you want to try the Benefit products, I highly recommend this baby. Have you tried any of the Benefit Box o’ powders? If not, which one would you like? 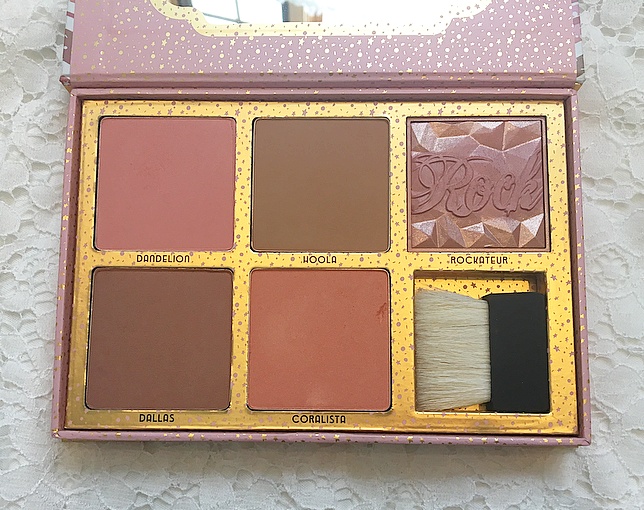 18 comments on "Review: Benefit Cheekathon Blush Palette"
I have been seeing this palette a lot and the more I see it, the more I want to buy it! It looks amazing! I have the Dallas bronzer, I do agree that it suites darker skin tones like mine because the Hoola is way too light for me! I think I would love Coralista! such a gorgeous set! I have one of these blush palette from a few Christmases ago but if I didn't I would be all over this! Love Rockateur! This looks so pretty! I love Benefit's powders, Coralista is one of my fave blushers! I have this and I absolutely love it, it's all I've been using since I bought it! This is a great palette! I've never tried any product for Benefit, but the Rockateur seems to be pretty amazing! this looks so pretty! I really need to dig out my benefit blushes again. So gorgeous! If I didn't have full sized versions of Dallas and Coralista all ready, I would definitely pick this up! I forget how much I love Benefit blushes. I want this too much, this is such a good idea. Baby Powder Mascara: Hack or Wack?